A new 22sqm eco-housing module has been unveiled in New York City, designed to spark public discussion and new ideas on the provision of sustainable and affordable housing, while limiting the overuse of natural resources and climate change. 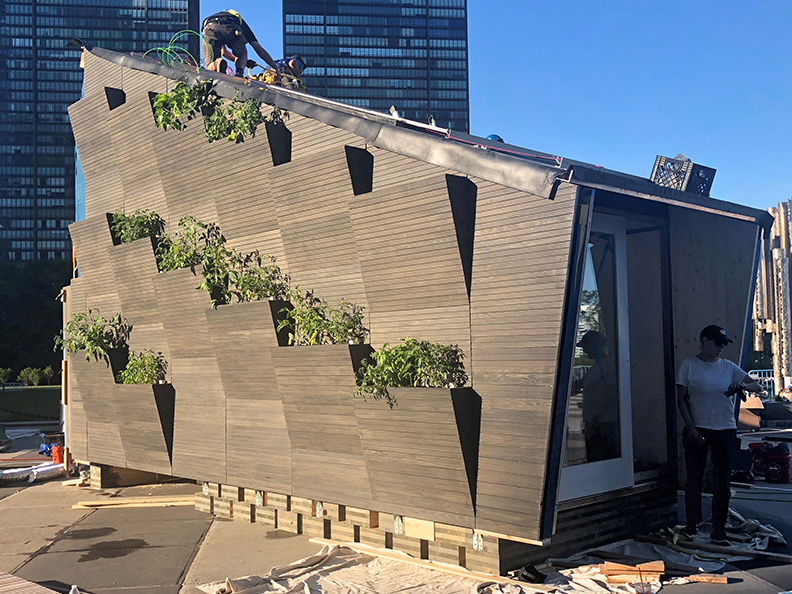 Delivered by UN Environment and Yale University, in conjunction with UN Habitat, the Ecological Living Module is constructed with locally sourced, bio-based renewable materials, and fully powered by renewable energy. “We clearly need more housing, but the key thing is that we also need smarter housing,” says Erik Solheim, head of UN Environment. The imperative to design and develop eco-friendly building systems and infrastructure is even more important in light of the fact that approximately one billion people across the world currently live in informal settlements. Still millions more live in buildings that are not environmentally friendly. On the back off rapid urbanisation and growth, communities must find ways to expand their capacities sustainably. “Architecture must address the global housing challenge by integrating critically needed scientific and technical advances in energy, water, and material systems while remaining sensitive to the cultural and aesthetic aspirations of different regions,” says Deborah Berke, dean of the Yale School of Architecture. The Ecological Living Module was unveiled at the United Nations High-level Political Forum on Sustainable Development, and is designed specifically to the local climate and context of New York, but future iterations of the module—including one in Kenya, the home of UN Environment—will respond specifically to local climatic and cultural contexts.